Designed for anyone just learning to play the drumset, this comprehensive and easy-to-use beginner's method is based on years of teaching drum students of all ages. 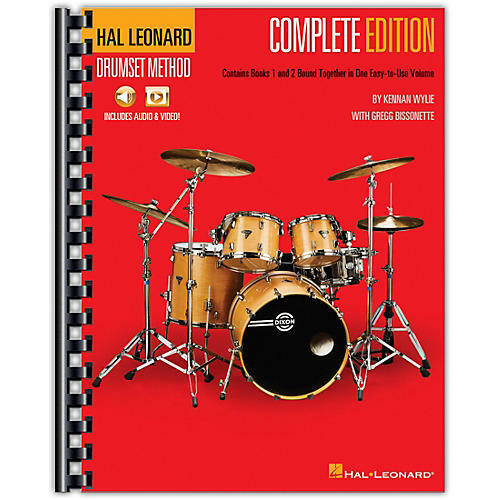 The two books included in this complete edition both includes hour of audio tracks for demonstration and play-along, plus video lessons by drum master Gregg Bissonette! Lessons in Book 1 include: drum setup & fundamentals · tuning & maintenance · basic music reading · grips & strokes · coordination & basic techniques · basic beats for many styles of music · 8th notes, 16th notes, dotted notes & triplets · drum fills · and more. Lessons in Book 2 include: limb independence · half-time grooves · syncopation · funk grooves · ghost notes · jazz drumming · chart reading · drum soloing · brush playing · and much more.